In the introduction to their chapbook On My Way To Liberation, H. Melt asks: “How do you envision trans liberation while living in a cis world?” The sixteen poems that follow struggle to answer this question, offering utopian visions that contrast the direct violence of a cisgender-centered world. The title poem draws a parallel between Melt’s contemporary Jewish genderqueer existence and that of their grandfather, who stepped into women’s clothing to remain with his family when Nazis threatened to separate them. Both moved through gendered lines in order to survive; both changed their name to mark liberation. Melt is a trans poet, artist, and educator living and working in Chicago. They co-lead the monthly Queeriosity salon at Young Chicago Authors, which features workshops and space for LGBTQ young adults to explore queer art and poetry. They also work at Women & Children First, a feminist bookstore in Andersonville. However, as Melt reveals in their poetry, even these spaces are rooted in a cisgender world that erases their identity: Melt has been misgendered by a queer poet giving a reading at their workplace. The poems that have stayed with me are the ones where Melt reworks incidents in their life, excerpting letters or notes and building a narrative around the effect those words had on them. Unfortunately, many more of the poems fall flat; the ones that use the plural pronoun (“we”) instead of the singular (“I”) feel too general. The chorus fails to share a new perspective. This isn’t to say that the only (queer, trans, marginalized) poetry of value is that which depicts suffering—rather that Melt shines as a poet when they narrate their own experiences, and in this collection those are mostly painful interactions with a cisgender world. “City of Trans Liberation” proposes a place “Where no body/asks for IDs/or our real names” and “Where we walk outside/in the daytime without/being harassed.” Given the state of our world today, these asks are disappointingly monumental, yet also appear surface-level. Is this the extent of trans futurism? Possibly, in the world we’re in, that’s all that can be dreamt of now. For me, a queer cis person living in Chicago, reading and reviewing Melt’s work is difficult. The magic of place, and the way a poet talks about the streets they walk, can disappear if the reader has their own experiences on the same pavement. Melt’s use of the collective “we” to describe experiences in these spaces papers over the different experiences that queer people have in Chicago, the ways that different spaces are accessible to some and not to others. Melt’s writing is peppered with the specific geography of the city—but only certain parts. An overwhelming amount of the queer havens discussed in The Plural, The Blurring and On My Way To Liberation are in Rogers Park, Andersonville, or other North Side neighborhoods. Queer south-of-Roosevelt readers might bristle at this northern focus, since we’re already used to giving exasperated sighs whenever we see yet another queer dance party hosted in Logan Square and must decide whether it’s worth the multi-hour round trip or double-digit rideshare fare. (Not to ignore the presence of groups like Las Topo Chicas and smallWORLD Collective.) As someone cis, I’m not always included in Melt’s “we,”—in The Plural, The Blurring this “we” references queer people and queer poets, while in On My Way To Liberation the “we” is trans people and trans poets—but when I was it reminded me of how alienating it can feel to have so many queer communities and resources concentrated in a place that feels so far away. 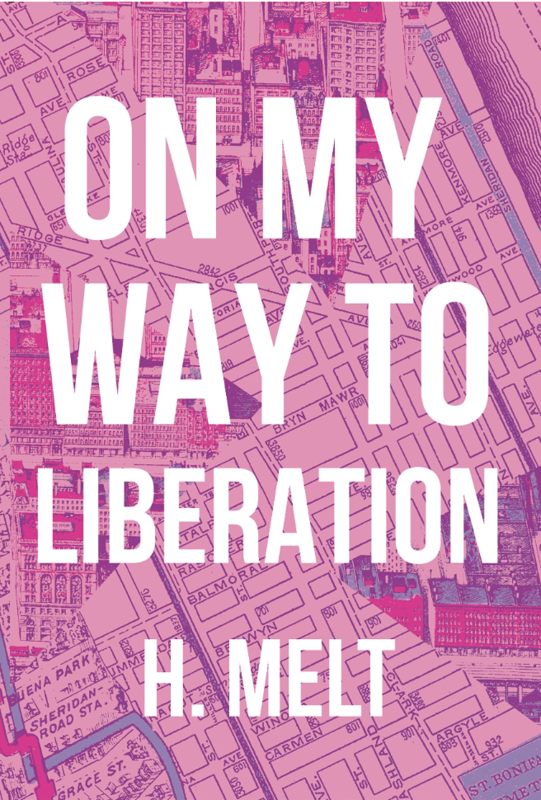 On My Way To Liberation is a preview of a longer work, There Are Trans People Here, slated for release next year; it will be exciting to see the ways Melt stretches their worldview to propose an even more radical trans future. Jasmine Mithani is an editor at the Weekly. She has been reading a lot of poetry lately, including Kwynology’s latest release and Patricia Frazier’s debut collection.